Introducing “Pocket Gettysburg” for your Smartphone! As the Gettysburg National Military Park commemorates the 149th anniversary of the great battle, we are happy to provide a public preview of a very exciting research tool and study guide that will be available soon. 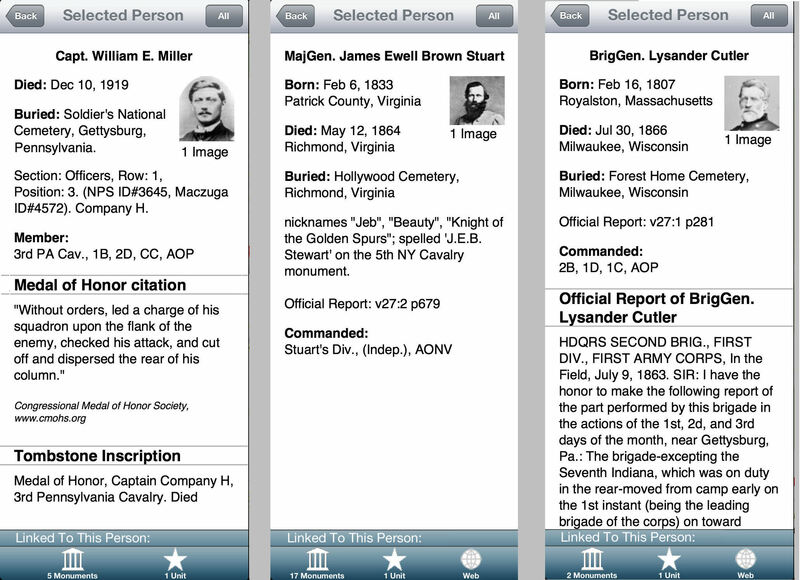 Whether you are walking the fields in Gettysburg or researching the battle from the comfort of your home, you can now have an electronic encyclopedia of Gettysburg in the palm of your hand! 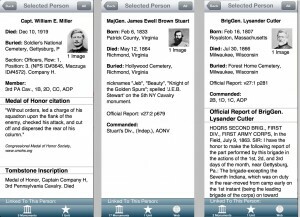 Pocket Gettysburg is a smartphone application that contains detailed information about the monuments, military units, and people that are associated with the Battle of Gettysburg. 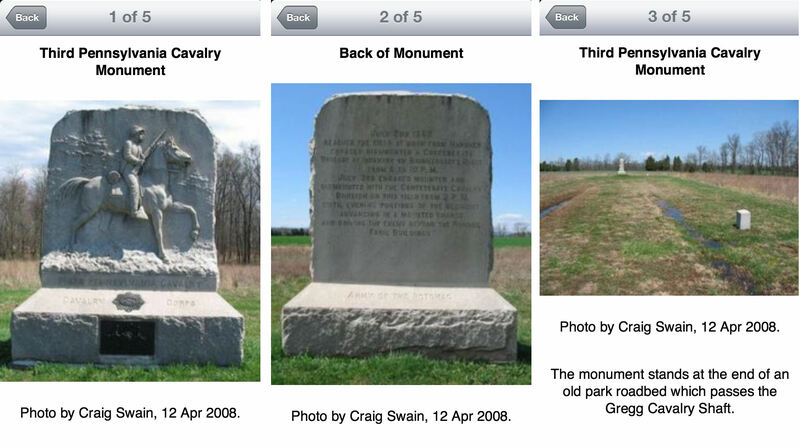 At its core, Pocket Gettysburg includes the locations, photos, and inscriptions of the more than 1200 battlefield monuments, historical markers, wayside signs, and plaques in the Gettysburg National Military Park and greater Adams County, Pennsylvania. But Pocket Gettysburg is so much more than a database of monuments! First, there’s the GPS-enabled map*. 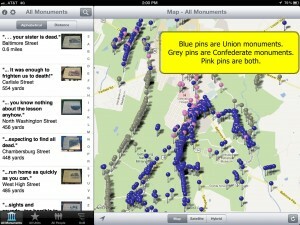 See the battle lines as represented on the map by Union and Confederate monuments. (Click to zoom in on this or any other image). 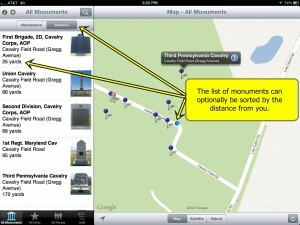 Walk the battlefield and see an updated list of monuments that are closest to your current position. 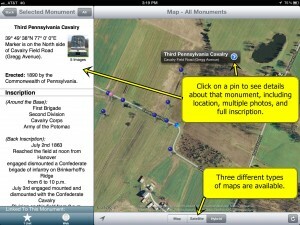 Filter the map to see a subset of the monuments that match your research interest. (This map is filtered to show only Maryland monuments). The satellite and hybrid maps show the monuments in the context of structures and geographic features. Click on a monument to see all of its details, including location, full inscription, and photograph(s). You can swipe your finger to scroll through multiple images of each monument. But one can’t learn about the Battle of Gettysburg merely by looking at monuments. Any study of the battle requires an understanding of the military units and people whose actions are immortalized by those stones. So Pocket Gettysburg includes a database of all 864 military units (regiment, brigade, division, corps, and army) that participated in the battle from both sides. Each monument is linked to its associated military unit(s). 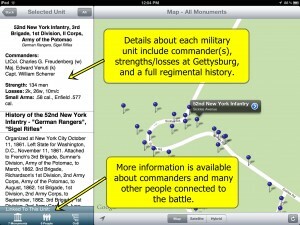 When viewing a monument, just click on a linked military unit to see its details. Information about each military unit includes its full name, nickname(s), regimental history, and details about its participation at Gettysburg, including commanders, total strength, and losses (killed, wounded, missing/captured), among other details. The searchable list of military units shows the succession of command of each unit as its commanders were killed, wounded, or captured over the course of the three-day battle. 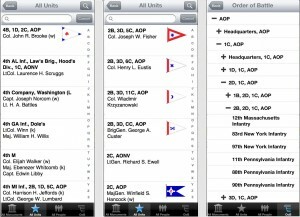 For Union brigades and higher, the list also shows battle flags and corps insignia. And, of course, there is a navigable Order of Battle for both armies. Three variations of the list of military units. The real story of the Battle of Gettysburg isn’t about monuments or military units as much as it is about people. …and 200 or so private citizens, politicians, famous residents, spouses, and others who are mentioned on a monument, witnessed the battle, or played a role in its aftermath. The list of people can be searched and it can be filtered to include only commanders, citizens, or all people. For thousands of those individuals (including nearly all brigade commanders and above), the database includes birth, death, burial information and/or a photograph of the person. 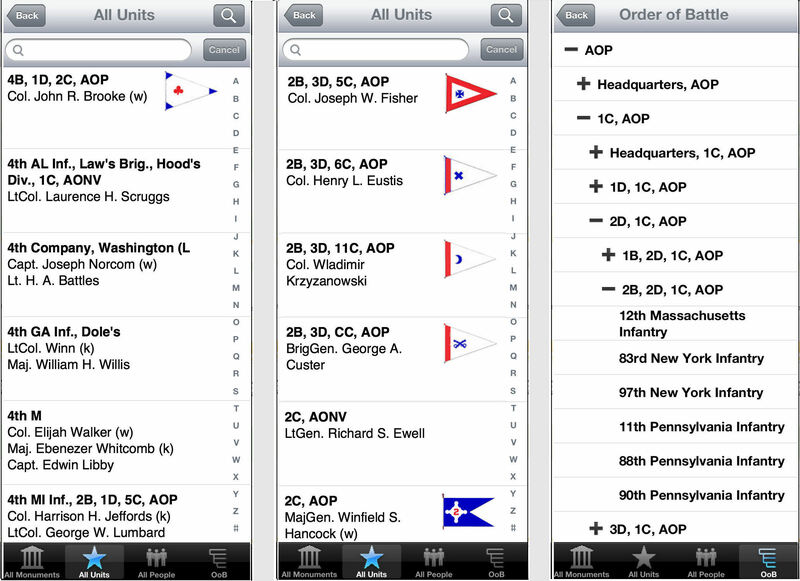 For most soldiers, the Person View identifies the State and/or unit(s) in which the person served and, when appropriate, a linked list of units which he commanded at Gettysburg. Many also include nicknames, spelling variations, other pertinent comments, and the full text of citations, tombstone inscriptions, or other data. Finally, in the case of surviving commanders, a citation is included to that officer’s “Official Report” (if any) after the Battle of Gettysburg. Over time, the full text of those Official Reports will be included, as demonstrated by a few included examples. Three variations of the Person View. As we’re sure you’ll agree from this brief preview, Pocket Gettysburg is truly a massive collection of information about the monuments, military units, and people associated with the Battle of Gettysburg. It will be the ultimate electronic research companion and an indispensable tool for those who study the Battle of Gettysburg. 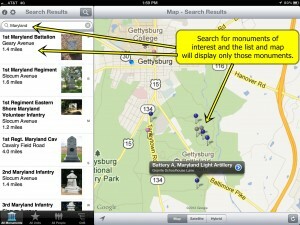 Pocket Gettysburg will be available for the iPhone and iPad within a few weeks with for the Android thereafter. Please visit www.SegTours.com for more information. *GPS features require a GPS-enabled device.